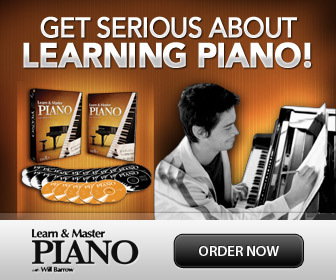 In this beginner piano lesson you will quickly learn to read piano music. This lesson is part 1 of a free mini "crash-course" in note reading for beginners. 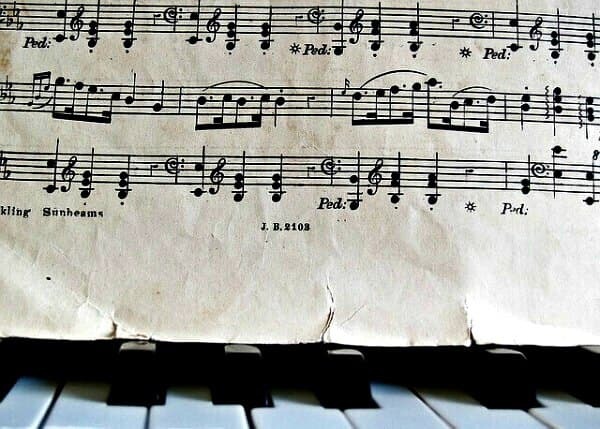 If you have no clue how to read piano music- this is for you! For this lesson, the only previous note reading skills needed is some understanding of basic "keyboard" knowledge, like direction (up and down), finger numbers and hand position. So below are first a few reminders before we start to learn to read piano music. Tip: In Learning to Read Music , you'll also learn all the basics you need and more. When playing towards the right on the piano we call it "up", and when playing to the left we call it "down" . 1. The treble part of the piano are all the piano keys from the middle of the keyboard to the right end (up). These notes have a high pitch. This part of the piano is usually played with the right hand. 2. The bass part is from the middle of the piano keyboard to the left end (down). This part is usually played with your left hand. When you learn to read piano music, you read two staffs (staves) at the same time. This is called a Grand Staff. The lowest staff is for the low or bass notes, and the upper staff is for the high or treble notes. You will start playing the right hand while reading the treble, or G clef staff and with the left hand you will read the bass, or the F clef staff. 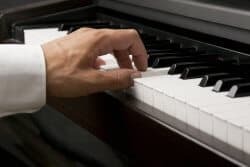 Apart from learning the finger numbers (above), it's a good habit to check your hand posture each time before you begin to play and when you finish playing each piece or exercise. Make sure you play on the tips of your fingers with a "cupped" hand with slightly curved fingers. Don’t worry so much yet if your hands “collapses” while you play, but fix the posture properly as you start and end at first. You'll soon get used to the correct feeling, and will gradually adjust it as you play instinctively. The hand position you will use when you learn to read piano music in this lesson is called “middle C position”. In this position, both thumbs will share "middle C". It's not the greatest position to play in since your hands are kind of "squashed" together, but when you first begin to learn to read piano music it's a very quick way to understand how the notes move. Let's Begin to Read Piano Music! and finger 3 the note E.
Notes are read from left to right, as you read a book. Here is a little melody using only these three notes. All the notes are quarter notes and last for one beat (or count) each. The melody moves only by steps yet. Oh, and yes! Always sing along the note names as you play the first time! and the 3rd finger plays A. Practice these three notes in the same way as above, up and down, here and there, singing (or saying) the note names. Here is a little tune using only three notes in the left hand. Keep singing the note names as you play! Now, let's practice both hands together. Both thumbs ( finger 1) are placed on the same note, middle C, the other fingers 2 and 3 in each hand is placed on their keys (D and E in your right hand and B and A in your left). Remember to keep a cupped hand position, and that all fingertips should rest on a key even when they are not used. -Ready for more? OK. Let’s add one more piano key for finger number 4 in both hands. and finger 4 in your left hand plays bass G.
In the following example you will also use half notes. They last for two beats. This time, count “1” for each quarter note, and hold each half note for 2 beats, while you count 1-2. Play slow and steady and count as you play! The treble, or G-clef tells us where G is. You play treble G with your right hand finger 5. And the bass, or F-clef where the lower F is. You play bass F with your right hand finger 5. Here is an exercise using all 5 fingers in both hands. This example also uses the whole note. The whole note lasts for four beats, count: “1-2-3-4” while you hold that note. Keep a steady beat. And...sing along those note names! Up to now, you have read notes moving in steps, and repeats. This exercise has skips as well. A skip is an interval of a third, skipping one note in between the notes up or down. Watch out for where the skips are! Remember to sing along the note names as you play, this helps you learn to read piano music easier and faster. For this example you should also count as you play, as you have 3 different note values. If you like, you can now continue your free note reading "crash-course" here: Reading Music Notes- A Mini Course for Beginners and learn to play both hands together! What do you think? Was this a helpful start to learn to read piano music? Leave your comment below- Thanks! How to Read Write and Understand Written Music.